You honor me today with your invitation to speak. And certainly, you honor me with an honorary degree from this esteemed institution. Graduates, you are a rarified breed, to be sure. Every year 10,000 students vie for one of the 875 slots in the freshman class. You not only were admitted, but today you sit here ready to graduate from college. To make a finer point, only one per cent of the world’s population has a four year college degree, and in that one percent, you are among the elite. 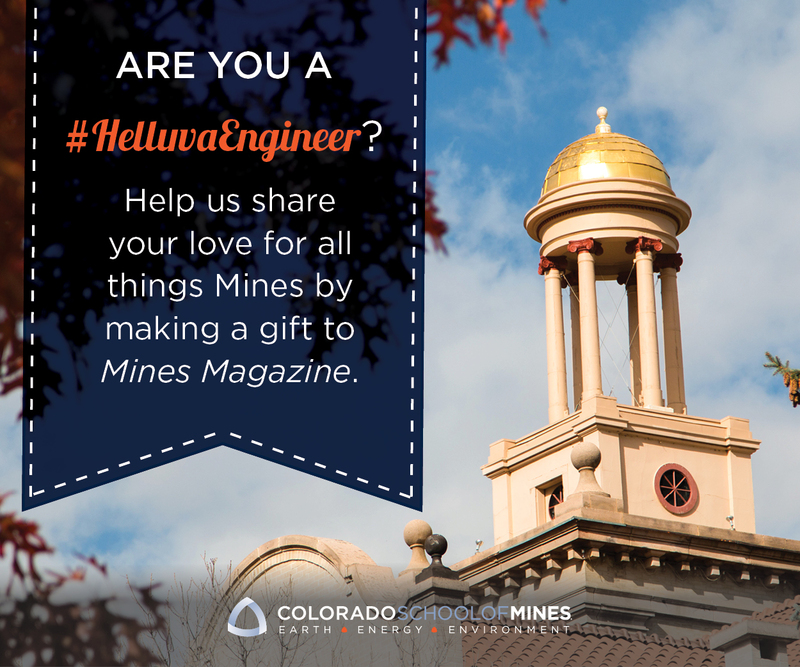 Such is the prestige of the Colorado School of Mines, in our state, in our country, and in our world. It is has been a great journey to serve as the Governor of Colorado. There are many parts of this work that is difficult, but there is a much longer list of things I do as Governor that are an unmitigated privilege. Speaking at college commencements is one such privilege. Now I will admit that some commencement addresses are more challenging than others. You see, I am a humanities student. And although I took Physics and Calculus in college, my degree is in what you would all call one of the softer sciences, Political Science. I never took a class in mining engineering, or metallurgy or geology or petroleum engineering, or chemical engineering, or geophysics or chemistry, or computer sciences, or civil, electrical, environmental or mechanical engineering. The fact that you not only took those classes, but that you likely majored in one of those various disciplines is a credit to your serious intellect, and also to your tremendous work ethic. I applaud each and every one of you for reaching this milestone today. Back to life experiences: Here is what I will tell you. I know, and you should know, that we are in one of the toughest times our country has found itself in. Our economy has not been hit this hard since the Great Depression. Our unemployment rate continues to hover stubbornly above 8 percent, and most economists say that the recovery is happening, but that our economy is expanding slowly. It may be a while, even several years, before we see normal unemployment numbers again. Add to that the fact that the political system is pretty battered after another expensive and highly negative campaign cycle, and that we continue to fight wars in Iraq and Afghanistan against a nimble and well-armed terrorist-backed enemy. With that news one would ask, how in the world could a college graduate find any reason to be optimistic? Or, put differently, is there any reason for hope? The answer, from where I sit, is ‘yes’ there is absolute reason to hope. There is great reason for optimism. And simply put, the hope and the optimism lies on this campus, in this school auditorium, it lies in you. The answer lies in you. And, so you know, this is not some gimmick for a graduation speech. I really believe you are the reason we all can hope for a better day. Earlier this week, at the state capitol, we held a press conference with NASA and with our Colorado Association for Manufacturing and Technology announcing a Memorandum of Understanding between NASA and the State. During my part of the program, I told the assembled media that the path forward for our state and our country is to return to those things that have made us strong for the better part of our history. For so much of our past we have been the creators of the next technology, we have been the innovators, we have been the best of entrepreneurs, we have been the country that refined the manufacturing processes, and then made things for the rest of the world. My remarks were picked up by parts of the national media because I said that our ability to emerge from this serious downturn in the economy, our ability to compete with other developed and emerging economies, rested in our being able to return to our roots as creators, as innovators, as inventors, as entrepreneurs, as a manufacturing economy. In a meeting following the press briefing, the NASA folks and the aerospace industry representatives all agreed. Each person at the table offered their own thoughts about how NASA and Colorado could partner, and how it would be beneficial for Colorado, NASA and the USA. The theme spoke to the serious links between scientific research, the development of cutting edge technology, and the positive impact on the economy. And the whole time I was thinking of this commencement speech. As engineers, as scientists, as people who understand the potential for scientific advancement in the 21st Century, the answer to so much of what ails the country lies in you. There is no better way evidence of my point than to look to how we as a nation and as a world can move toward a clean energy economy. It is my firm belief, and it has been a cornerstone of my administration’s agenda, that there is great promise in developing a clean energy economy in Colorado, and offering that template to the USA. A new and different energy economy begins in the laboratories with research and development of products that are the next generation in wind, solar, geothermal, carbon sequestration, fuel cells, turbine technology, smart-grid appliances you name it. Then we transfer the technology from the laboratory to the factory floor, and become the world’s premier marketplace of energy innovation and product development. And finally we take the product from the factory floor to the grid, producing clean energy for America’s homes and businesses. In the process we have created jobs in a 21st Century industry, we have reduced our trade deficit because we are producing energy from DOMESTIC resources, and we have addressed serious environmental challenges that exist today, for our nation, and for our world. But it all begins with the science it begins with you. A few months ago, I had an opportunity to appoint an Appellate Court Judge to fill a vacancy on our Court of Appeals. I wound up appointing a Colorado School of Mines graduate, Terry Fox. After graduating from Mines, Terry ultimately carved a path to law school, and then a career in both private and public law. Why? Because as much as Terry loved the world of engineering and science, her real passion became the law. Terry Fox followed that passion to one of the highest courts in our state, and we as a state, are better for it. Finally, I would encourage you, in whatever you do, to look for opportunities to be a person of service. Service can come in many forms in volunteering in your community, in an elementary school, or through a civic club. Public service might mean you serve in elective office of some type. And Service might mean that you wind up in a foreign country in the Peace Corps or as a missionary, working on issues that face people living in the Third World. Service has many faces, but what it does is allow you to be a part of something that is bigger than yourself, that carries meaning beyond a paycheck. There will come a day someday, when you look back on your life and ask whether it was all worth it. I promise you that it will be the places where you were of service to others that will cause you to emphatically say yes, it was worth it it was well worth it. So, thank you again for the privilege of speaking today, and thank you for all of your hard work that allows you to walk across the stage today. The world needs you. It needs you now more than ever. It needs your mind. It needs your passion. It needs your service. God Bless You All.